Welcome, we are Deadstar Publishing. Based in Cardiff, Wales, we specialise in publishing works of fantasy, science fiction and horror from artists and writers all over the world. We were established in 2010 with the intention of promoting new talent and several people who had their first works published by us have gone on to make writing and illustrating their full time careers. We aim to release between five and ten new titles each year, and publish books, comics and graphic novels in both physical and ebook formats. 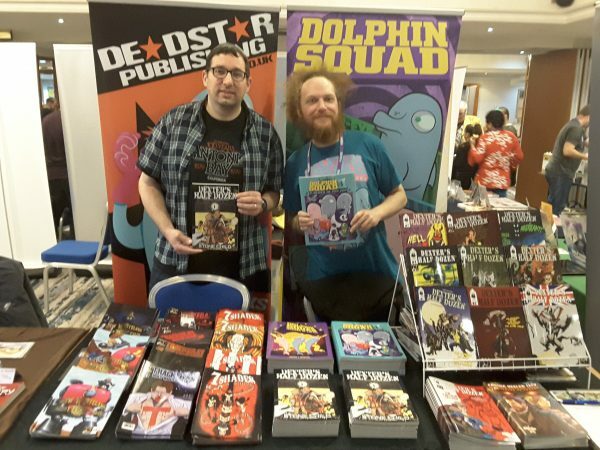 Our titles are available from most good bookstores, as well as here on our website and at several book and comic conventions around the UK each year. Our flagship products at the moment involve crime-fighting dolphins and commandos facing off against supernatural horrors – which sums up the range in our titles! Check out our store to see the full range of works we’ve published, as well as merchandise like t-shirts, mugs and posters based on our characters. We update our store and news page quite regularly so keep checking our blog for updates, and remember to subscribe to our newsletter too. We also have a Facebook page where you can meet our other fans and see photos from our past expos and signing events.